Spaghetti was one of my favorite meals when I was a kid. I remember being so excited for dinner when there was a big pot of this meaty tomato sauce sputtering and bubbling on the stove. And you know how there are things that your family does that you don’t know are super weird until you discover that nobody else’s family does them?? My three-year-old gets as excited as I did do about spaghetti for dinner, and it’s hard to beat pasta for a super-speedy meal. I usually have a jar of store-bought marinara around for making pita pizzas for lunch or a quick kid dinner when we’re going out, but if I’m going to eat a bowl of spaghetti I want it to be covered in this sauce. And once you make a big batch and freeze a few containers of spaghetti sauce for later, it’s just as easy as opening a jar – and so much more delicious! Start by browning the ground beef (or turkey!) with onions and garlic. Open and dump in canned tomatoes: diced, crushed, paste, and sauce, and then some herbs and seasonings. Then – simmer! After an hour or so, you could really eat this stuff with a spoon and call it a meal – as the sauce cooks down, all the flavors…the onions, the basil, the oregano…deepen and mingle. And the texture! This isn’t sauce that will slip down off your noodles and puddle sadly in the bottom of your bowl. It’s thick and meaty and…yum. I’m usually trying to be virtuous, and I do like the whole wheat pasta that dominates my pantry, but I love angel hair. You can use whatever pasta you like (or spaghetti squash or green beans for a paleo or low-carb option, or pile it onto these Italian zucchini boats!). 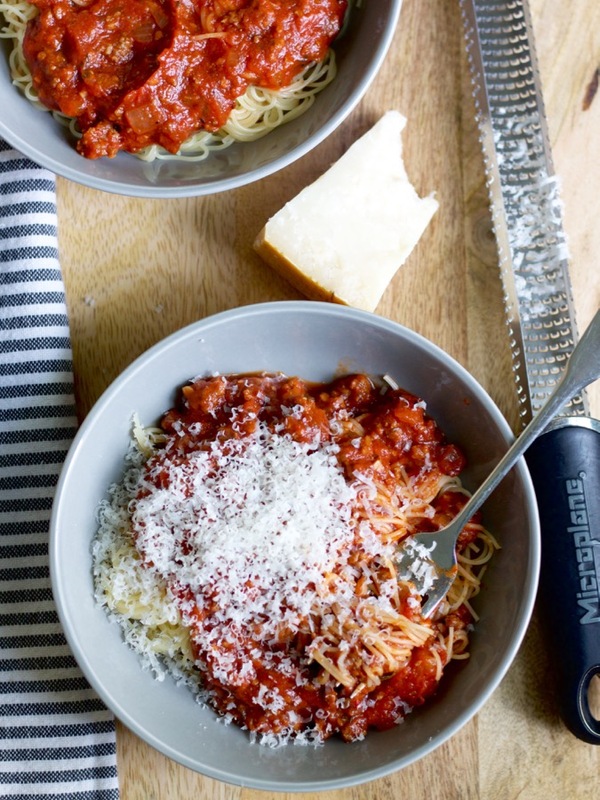 We love our spaghetti with a sprinkle of parmesan cheese. So whether you’re a garlic bread person or a peanut butter bread person (or…a crusty no-knead bread with salty honey butter person!) 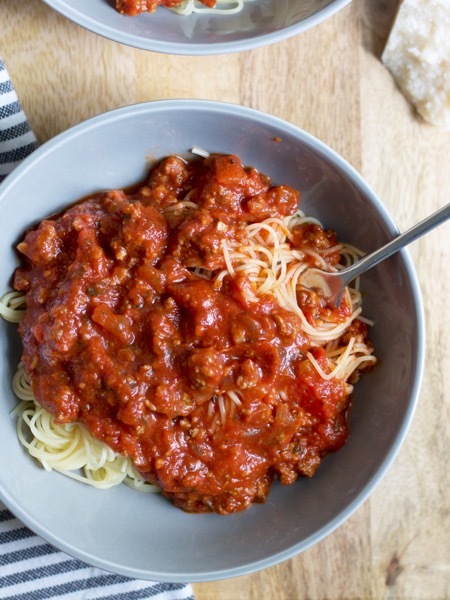 fill your freezer and your tummy with my favorite homemade spaghetti sauce! Heat a large pot over medium-high heat. Add half of the ground beef and let it brown, stirring and breaking it up with a wooden spoon. Remove it to a bowl and add the rest of the meat. After a minute of letting it begin to brown, add the onions and garlic, stirring and breaking up the meat until it is cooked through. Drain the fat if needed (I use lean beef and don’t find this necessary). Add canned tomatoes and seasonings. Reduce the heat to medium-low and simmer, uncovered, for 1-1.5 hours, stirring occasionally (a piece of foil wrapped around the top of your pot is a helpful splatter-guard). It can stick and burn on the bottom if it’s turned up too high or you don’t stir enough, so err on the side of keeping the temperature low! This recipe is from my Nana, who also brought us potato soup! I typically divide the sauce into thirds and freeze two containers (so each time we eat it, it’s enough to feed our family for dinner plus leftovers for lunches). This sauce seriously is the best I’ve ever tasted. Your “puddle sadly in the bottom of your bowl” is pathetically accurate of all jarred sauces I’ve tried. And blueberry muffins with their vegetable soup!! Wait. Are you allowed to eat something different from that?? How about Kraft macaroni and cheese… and peas. Babysitter Night Dinner of champions! That was definitely the best Babysitter Night Dinner. I still serve peas with mac and cheese, because Obviously They Go Together in my mind..
I’ve been hungry for this ever since you posted it, and made a potful tonight. It really is the BEST sauce. You’ve done a service to the world by sharing it here, Bet. I actually do not like spaghetti, BUT once I had Lauire’s (aka. Nana’s) sauce, I had a change of heart!! What kind of container do you freeze the extra in?? I’m making it tonight! I have (almost) always made homemade spaghetti sauce, using a very similar recipe. Which was my Granny’s and can assure anyone who’s never made their own sauce that this is a GREAT recipe. I made homemade sauce for the 1st time when I cooking for my boyfriend (now my husband), I was 18yrs old. We just celebrated our 36th anniversary. I admit when my kids were younger I would occasionally use the jar sauce, add meat and tweak it. It was easier especially working full time and with 3 kids involved in sports year round. 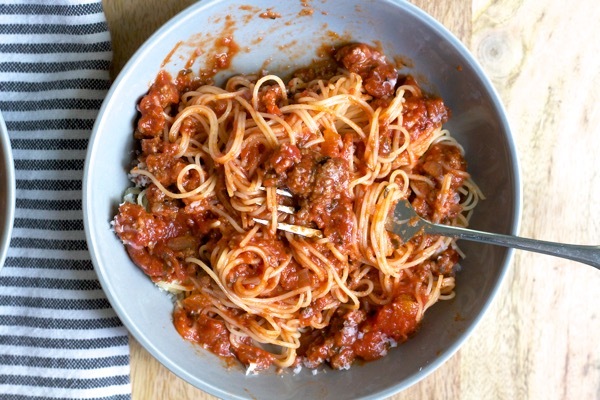 I couldn’t believe it when I saw a “recipe” on Yummly that used jar sauce and added meat. To me that’s not a REAL recipe…that’s directions for making a quick meat sauce. Don’t get me wrong that’s not a bad thing. But it’s also not a recipe for “homemade” spaghetti sauce. Thanks for the great recipes. I love Yummly and wish it was around when I had kids at home.